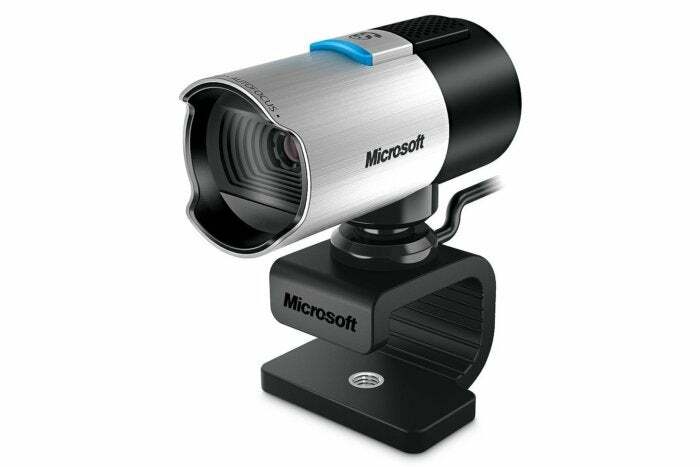 You can use this high-end LifeCam for a variety of purposes. Billed as the top dog of Microsoft’s LifeCam line, the LifeCam Studio ($100 MSRP, currently available from Amazon for $55) pulls out all the stops: 1080p video, Skype certification, and an eye-catching durable design. It mostly lives up to its high-end promise, too, ranking near the top of the heap, with a few caveats. In keeping with its line-leading status, the Life Cam Studio sports a tony design in black and silver aluminum. The barrel-style camera features a petal lens hood to reduce unwanted light above and below the glass lens, and the rubberized mount flexes rather than hinges to conform around displays. It also has a threaded hole at the bottom for tripod mounting. A small mono mic is integrated into the top-back end of the camera. With a 75-degree field of view, the camera provides a bit of wiggle room in the frame without you having to move it. Should you need to, though, it rotates 360 degrees—180 degrees in either direction—so you can change the camera angle without having to detach it from your display. The LifeCam Studio’s versatile mount allows for attachment to displays or a tripod. Given the camera’s smart looks, it was a little disappointing to find that its specs weren’t quite so pleasing. The Life Cam Studio is advertised as delivering 1080p HD video recording. What this means, however, is that it boasts a 1080p sensor, but you can’t actually take advantage of it without commercial third-party webcam software such as Cyberlink’s YouCam. Microsoft caps out-of-the-box video at 720p. Video calling is also limited to 720p resolution. That’s adequate when you’re casually chatting with friends and family, but it’s a bit below the bar for corporate settings where video conferences are typically held on full-HD television screens. In those situations, you want to use a camera that supports 1080p video calling. On our humble PC display, the LifeCam Studio did pretty well. The image was sharp with vivid colors in just about every type of lighting environment we tried. This was no doubt due to the camera’s TrueColor Technology, which works by tracking your facial movement and adjusting the exposure accordingly. The camera’s 5MP still images were also crisp and balanced. Even though the mic is mono, it reproduced warm vocals, but it also picked up a fair amount of ambient noise in bustling rooms. The camera rotates freely, but not necessarily smoothly; the mount doesn’t fit snuggly enough on most displays to stay still (or even attached) when you rotate the camera. As a result, repositioning it is a two-handed task: one hand to hold the mount in place and the other to swivel the barrel. Despite its slightly misleading 1080p promise, the LifeCam Studio is an excellent webcam for both personal and business use. For the same price, though, you can pick up the Logitech HD Pro Webcam C920 or C922x and get out-of-the box 1080p video and stereo sound—so despite its strengths, this top LifeCam remains second fiddle. 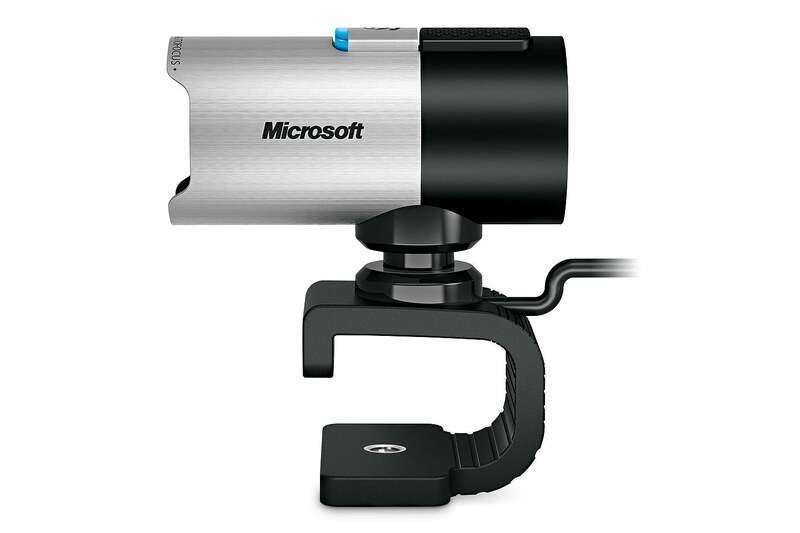 The Microsoft LifeCam Studio is an excellent hi-def webcam for personal or business use.